Another playback singer compilation; a collection of ghazals sung by Mohd. Rafi. 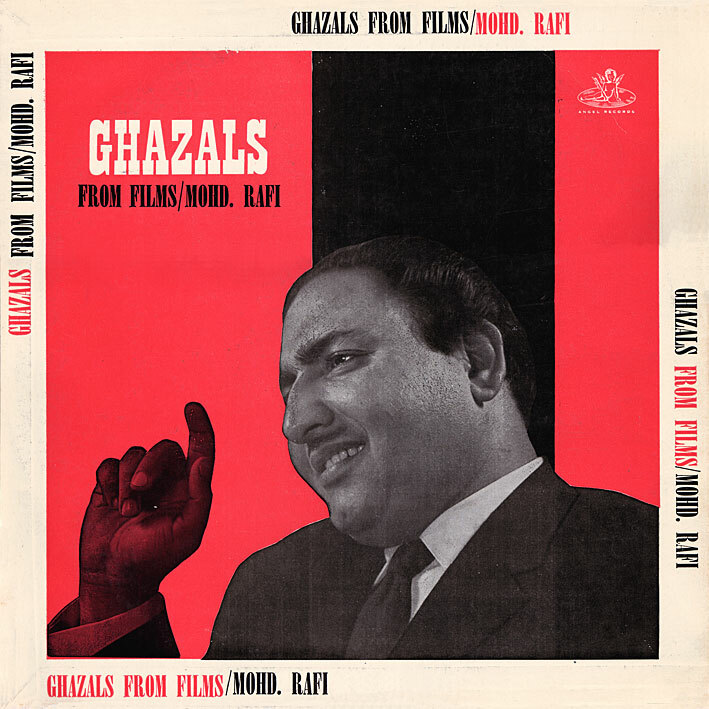 "Ghazal" is a term relating more to lyrical than musical content, but it comes as no surprise that these are, to a large extent, low key, traditional sounding songs. I know that many who follow the blog have, like me, a fondness for the stuff Rafi did with Shankar Jaikishan (especially), those cool jazz or high energy rock 'n' roll numbers; there are however no 'Jan Pahechan Ho's here. But it's an album worth attention nonetheless. Lots of lovely songs; 'Ab Kya Misal Doon', 'Husna Wale Tera' (I love the glockenspiel sound) and 'Tero Pyari Pyari' (which is Shankar Jaikishan) are current favourites. There's something warm and reassuring about Rafi's voice on everything here. I like it. This is the first in a five day series of Rafi LPs. Sort of by popular demand. A whole week? WOW! THANKS! Thanks so very much PC for these Rafi albums. However, I am unable to figure out how to download these. Whenever I try to download, I see an executable file and the .exe extension is added to your *.zip file. I am not comfortable in downloading the executable file. Would you please let me know where to find your *.zip file. Thanks. That doesn't happen when I do it, so I'm not sure what you're doing wrong to be honest. From the lix link you click "continue", then "click here" next to the hosting site of your choice. Thanks PC for the response. Actually, I have downloaded several albums from your blog before, but forgot one step since then: this time I missed a link (with a long sentence) displayed after I clicked on a hosting site. OK, so finally I downloaded all these Rafi albums - all so good that I cannot thank you enough. So I wish you a long, happy life (Amen). Vow that turntable era, remember buying this LP in 70s, still had with me till 2015, then lost it while shifting. All songs are marvellous.